Andalucia Small Group Tour: 13 days with Amber Road » Our 17 year! Andalucia Small Group Tour Overview: Andalucia is the southernmost region of the Iberian peninsula. We begin with the fabulous 13th century Alhambra, a paella cooking class and a night of flamenco in Granada. Our journey continues to the Great Mosque of Córdoba, through the extraordinary landscapes of Ronda and stop at an olive oil mill for lunch in the White Villages. 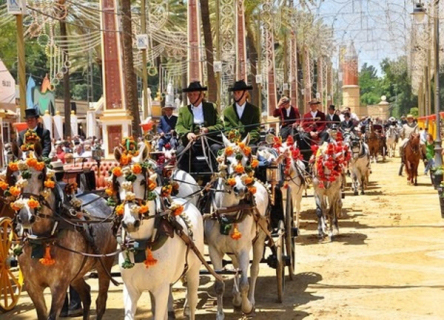 A performance of dancing stallions will follow at Jerez where we’ll also check out their dry sherry. 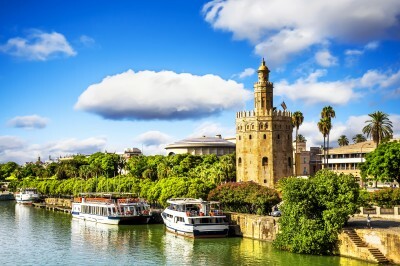 At Seville we stroll through the palaces of the Alcázar and the Casa de Pilatos and walk along the Guadalquivir River. A nearby bull farm visit with bullfighting demonstration and barbecue accompanied by fine Spanish wines highlight our last days on tour. Perhaps there never was a monument more characteristic of an age and people than the Alhambra; a rugged fortress without, a voluptuous palace within; war frowning from its battlements; poetry breathing throughout the fairy architecture of its halls. In 711 an army of North Africans and Berbers crossed the Straight of Gibraltar united under their faith in Islam to begin what would become almost 800 years of Moorish reign in the Iberian Peninsula. Named Al-Andalus – land of the Goths – by the Muslim conquerors, Andalucia is as rich in history and culture as the landscape is diverse. Consisting of eight provinces, the region varies from sandy beaches to olive groves to the steep hill top towns of the Sierra mountains. Moorish influence is prevalent throughout most every facet of life whether it be the adobo and cumin spices of traditional dishes, the repetition of geometric tile patterns in architecture, the lopped off towers of former mosques where churches and cathedrals now stand or the recurrent calligraphy of Islamic Art. Arrival at the Granada airport, where you will be transferred to the 17th century boutique Hotel Casa 1800 Granada (3 nights). 6:30pm orientation and welcome meeting with your tour manager followed by an introduction to Andalucian cuisine. Granada (Gáranata) was once the grandest city in Spain! Set at the foot of the Sierra Nevada mountain range it is the most visited of all Andalusian cities. When Isabel I, the queen of Castile and King Ferdinand II of Aragon, married in 1469, the pair united the peninsula’s two most powerful kingdoms and began a period of economic growth and religious zeal never before seen. They were the driving force behind the brutal Spanish inquisition, beginning the forceful conversion, expulsion and persecution of all non-Christian believers in what was formerly a religiously tolerant Hispania. 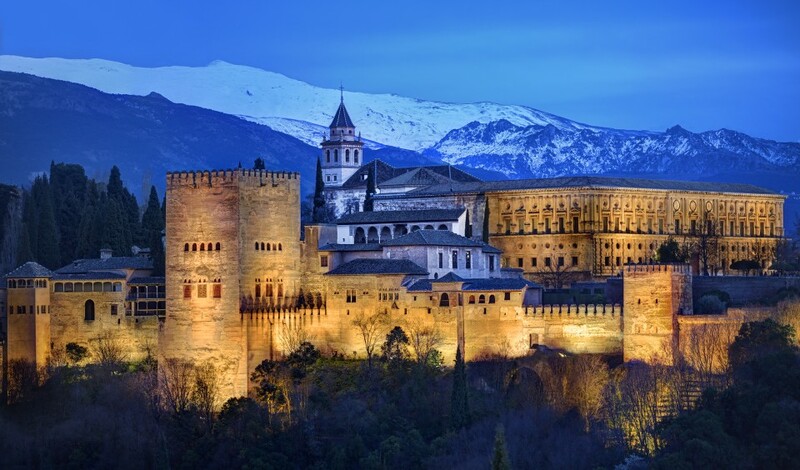 Granada was the last city of Al-Andalus to fall to the Christian Reconquista in 1492. Our local guided tour of the old town begins with a walk through the historic center and a visit to the Real Capilla, the Gothic mausoleum and burial site of Ferdinand and Isabel. The chapel has important collections of art from Spanish and Italian painters including Botticelli and Perugino. 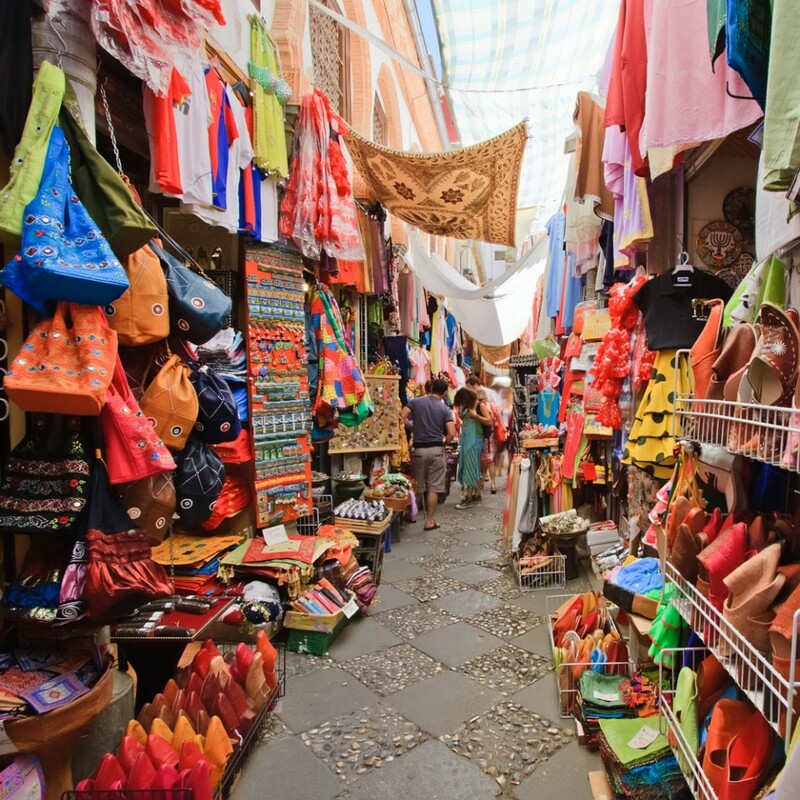 The origins of the Alcaicería, the Great Bazaar of Granada, date to the 15th century when it was a huge marketplace for Arabic silks and spices. 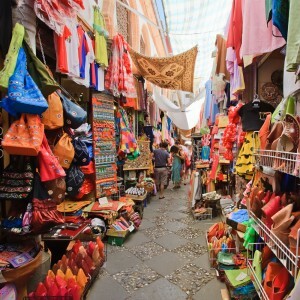 Today you will still find interesting, exotic items to purchase and a taste of the old market ways. This evening will feature a show at the Casa del Arte – the perfect acoustic venue for the sounds of gypsy guitar and foot stomping beats of Flamenco! A short ride will transport us up to the magical Alhambra Palace. Originally constructed as a fortress in 889 and converted to a royal palace for the Sultan in 1333, the Alhambra embodies Islamic art and tradition. 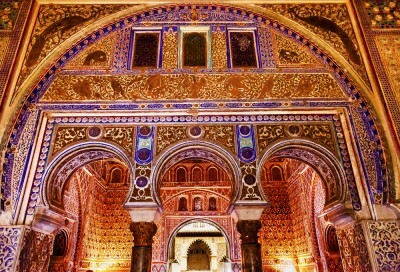 Arabesque geometric patterns typical of the Mudéjar – the post re-conquest Moorish style – adorn the painted tiled walls. The fortress is complemented by lush gardens and the sounds of running water heard throughout. The Generalife is one of the oldest surviving Moorish gardens, built in the 13th century as a leisure escape for Granadan kings. Paella cooking lesson and included lunch. Make your way back down the hill at your leisure, stopping in tearooms and shops along the way or take the train. Evening free. The Renaissance jewel of Úbeda was once a geographic buffer between Castilla La Mancha and Andalucia. It is reminiscent of Italy, with its monumental historic center, palaces and churches. 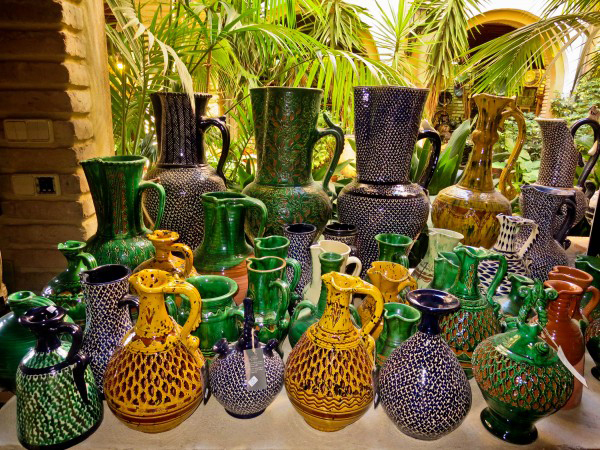 Úbeda is world renowned for its pottery. The Romans, Moors, and Spaniards introduced many innovations that are still present in the artisan style today. Included lunch at the Parador de Úbeda, a 16th century Renaissance palace. Afternoon arrival to the historic center of Córdoba. Our lodging for two nights is the 17th century Las Casas de la Juderia Cordoba, just a moments’ stroll from the Great Mosque. 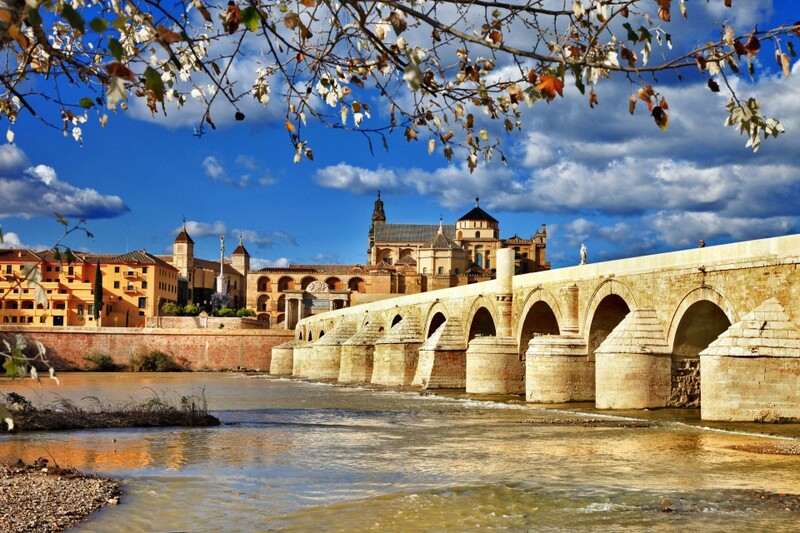 Córdoba served as provincial capital for the Roman Empire and was the capital of Al-Andalus during Moorish times. In the 10th century it was the most populated city of the world with public libraries, public baths, medical schools and universities. The Moors brought an educational system to the Dark Ages of Europe and made tremendous advances in mathematics, astronomy and medicine. They were well known for their religious tolerance. This morning we’ll take a guided walk through the second largest Old Town in Europe, visiting the Roman ruins; the old Jewish quarter and Synagogue; and Córdoba’s grandest monument, the Mezquita or Great Mosque. 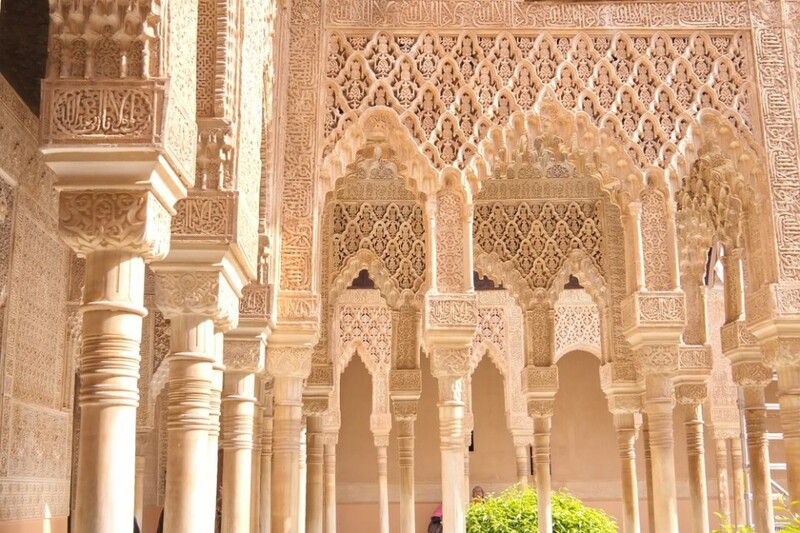 One of the most impressive of Moorish structures, the Mezquita took over 200 years to build and is the largest Mosque in Europe – 24,000 square meters and is noted for its 856 red and white columns taken from Roman temples that previously occupied the site. Afternoon free for your own explorations. Evening included dinner. 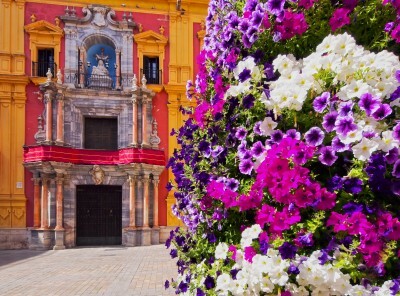 Today we travel south to Málaga on the beautiful Mediterranean Costa del Sol. Málaga was founded by Phoenicians around 770 BC and subsequently ruled by Carthaginians, Romans, Visigoths, Moors and, since 1487, Spanish Christians. Our local guide tour will explore the old historic center and harbor and walk us through the centuries, visiting Phoenician walls, the 1st century BC Roman theater and 11th century Alcazaba, a Moorish military citadel and royal residence. Painter and sculptor Pablo Picasso, native of Málaga, is recognized as one of the most important 20th century artists. With a varied career that spanned more than 7 decades he is perhaps best known for cubism; where objects are analyzed, broken up and reassembled in an abstracted form creating a new way to view an object on canvas outside of its 2 dimensional form! Picasso is also known for his 1937 painting “Guernica” depicting his disdain for fascism and the bloody Spanish civil war. We’ll spend late morning at the Museo Picasso Málaga. 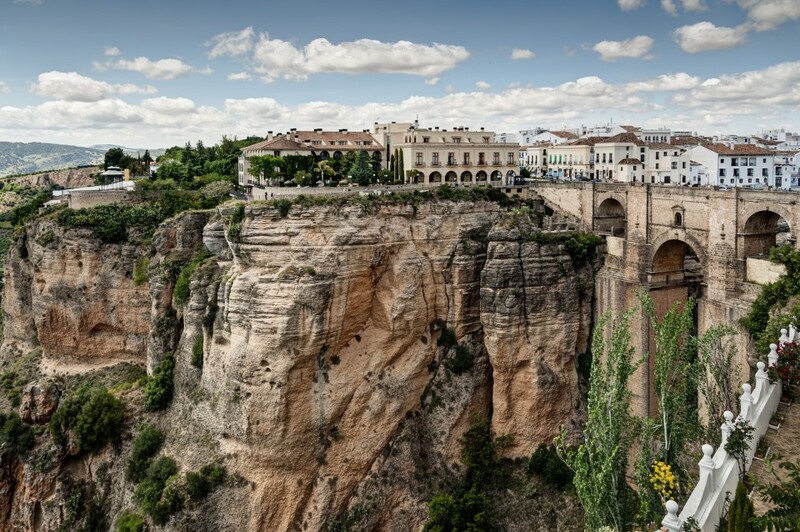 Mid afternoon we’ll leave the coast for the mountains to charming Ronda where we will spend two nights at the boutique Hotel Montelirio offering spectacular views of the River Guadalevín. Evening free. 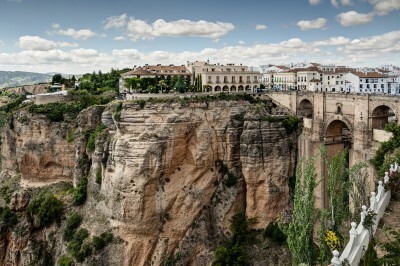 Ronda, favorite summertime home of writer Ernest Hemingway, is set around the remarkable Tajo Gorge. The most impressive aspects of the town are its three massive bridges spanning the 390 foot deep canyon – the Puente Romano, Puente Viejo and Puente Nuevo. Our local guide visit will begin with an exploration of the old town and the best viewpoint for admiring all three bridges. We’ll cross over Puente Nuevo into the new town to Plaza de Toros, Spain’s oldest bullring and home to one of the most famous bullfighters in Spanish history, Pedro Romero. Included dinner. 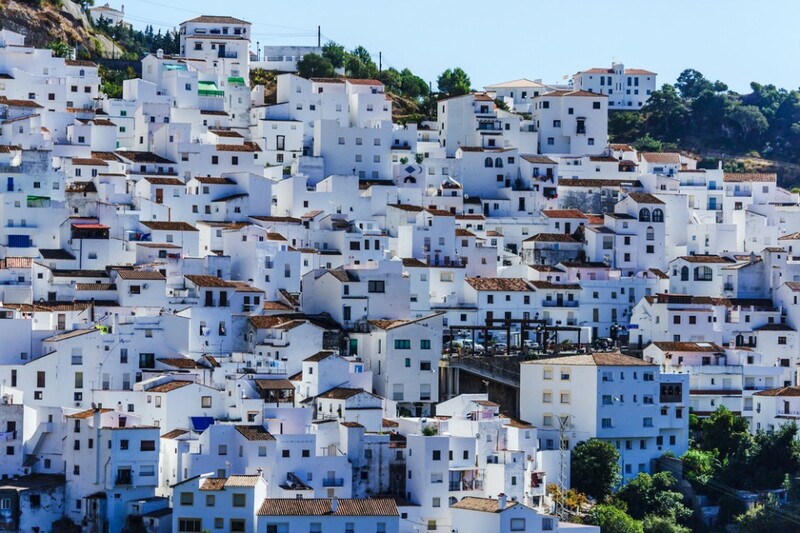 Journey to the Pueblos Blancos, the quintessential white villages of southern Spain! We pause for a café con leche in the curious town Setenil de las Bodegas where dwellings have been built into the cleft of rocks cut by the Guadalporcún River. Zahara de la Sierra is a quaint mountaintop hamlet overlooking a stunning crystal blue reservoir. We’ll stop in at an olive oil mill for a tour and a tasting followed by a Mediterranean lunch! Late afternoon arrival to the sparkling seacoast city Cádiz. Our hotel is the stylish and contemporary Hotel Parador de Cádiz (2 nights). 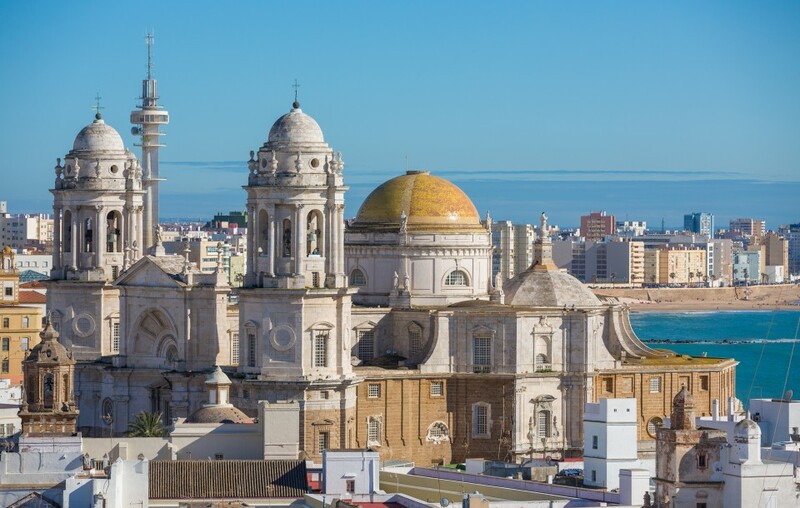 Founded by Phoenicians 3,000 years ago, Cádiz is the oldest inhabited city in Spain and one of the oldest in Western Europe! 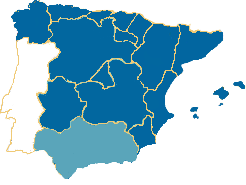 Its past rulers include the same Carthaginians, Romans and Visigoths, Moors and Christians as Málaga. It was home port to the Spanish treasure fleet during the Empire and, from the 18th century to today, to the Spanish Navy. Cádiz is architecturally distinct from other Andalucian cities, with colonial homes and cobblestone streets and boasts some of Spain’s most beautiful beaches. Morning guided tour of the Old Town with its bustling narrow streets and striking squares, the Roman theater, port and castles. A visit to Cádiz is not complete without a tour of the fish market, located in a former Franciscan convent, marvel at the abundance and variety of the daily catch. Mid morning departure for the Royal Andalucian School of Equestrian Art at Jerez where we will tour the stables and training areas and enjoy a performance of “dancing stallions.” The school is devoted to maintaining the classical traditions of Spanish baroque horsemanship. Sherish, the Arabic term for sherry, follows just behind Flamenco and bullfighting in popularity for southern Spaniards. Made from the Palomino grape, there are two basic styles, oxidized and non-oxidized and vary from quite dry to semi sweet. Your tour manager will be sure to introduce you. Late afternoon arrival to Seville, our first stop will be the Plaza España set amidst the wonderful gardens of Maria Luisa Park. Built in 1929 for the Ibero-American Exhibition (World’s Fair) it is an impressive example of Renaissance Revival style architecture. Our lodging for the last three nights on tour is the labyrinthine Hotel Las Casas de la Juderia Sevilla located in Seville’s most renowned neighborhood and former medieval Jewish quarter, Santa Cruz. Evening free. 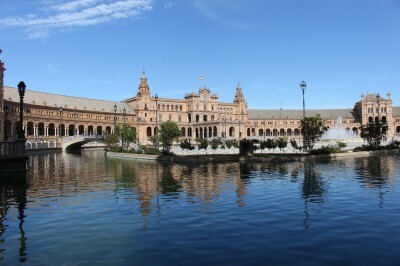 Situated on the banks of the Guadalquivir River, Seville is the capital of Andalucia and the most cosmopolitan of its neighbors. With a flare for drama, its own traditional dance and flamboyant modern architecture, Seville displays Spain’s most noticeable local pride. Known as Hispalis in Roman times, Seville was taken by the Moors in 712 and remained a Muslim capital until the 13th century. Between 1503 and 1718 Seville had a monopoly as the only trading port between Spain and the Americas, becoming extravagantly wealthy and spawning a Golden Age of arts and literature. The original nucleus of the Alcázar, where we’ll spend our morning, was constructed by the Moors in the 10th century as a fortified governor’s palace and is still in use today as a residence for the Spanish royal family. It is a spectacular complex of palaces, courtyards and gardens from various periods and in complementing architectural styles – all in all a dazzling trip back in time. Afterwards we’ll depart for a very entertaining bull farm visit outside of Seville where we will learn about the raising of bulls and witness a bullfighting demonstration! Included lunch and wines at the farm. 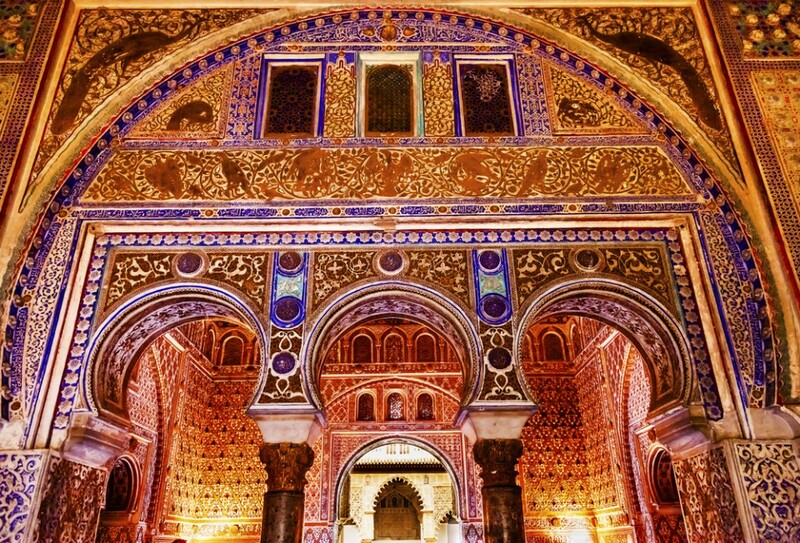 A guided tour of the Casa de Pilatos, an early 16th century Seville Golden Age palace, constructed by the Marquis of Tarifa in a mix of Italian Renaissance and Spanish Mudéjar styles. Late morning we’ll visit Seville’s Cathedral of Saint Mary, the burial site of Christopher Columbus. The largest cathedral in Spain and 3rd largest in the world, Saint Mary was built on top of the Almohad Mosque. Two parts of the mosque were preserved in the cathedral: the Moorish entrance court Patio de los Naranjos; and the Giralda, a minaret converted into a bell tower. Afternoon free. Evening farewell dinner. Morning transfers at scheduled times to Seville airport and train station. Book a multi-city ticket into Granada and out from Seville. Seville airport (SVQ) is not large so you’ll find the best flights appear on search engines 5 months prior to departure. Pre tour: If you choose to arrive early you will be met by our driver at the airport and transferred to the first hotel on tour. For arrivals to Granada on Day 1 of the tour you should arrive to the airport no later than 16:00. Suggestion: Central Spain and Andalucia tours fit back to back. 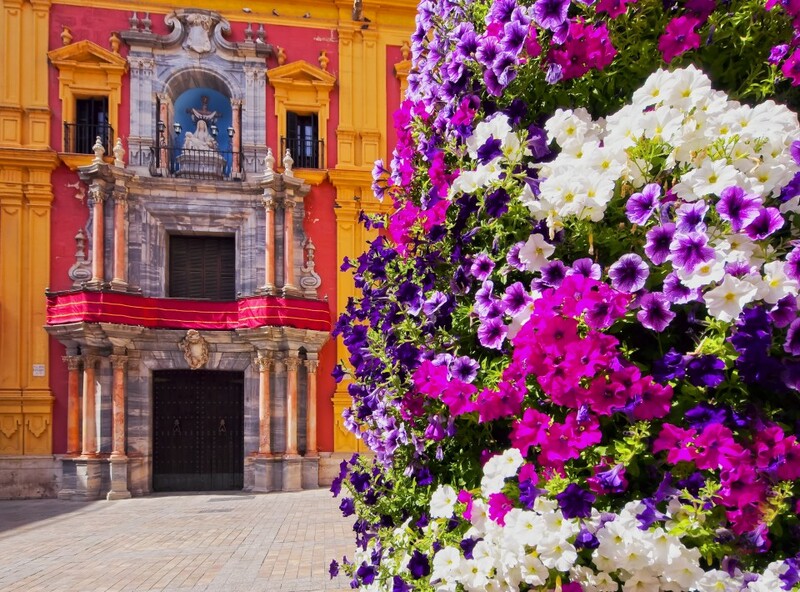 There is much more to see in Seville than we can cover in three days. If you have the time an extra day or two post tour would be rewarding. There is a lot of walking on this tour and you will be on your feet several hours each day. You will find challenging inclines in Granada, Ronda and the White Villages.This tour is not suited for anyone who has problems with knees, back, heart, obesity or those who cannot manage steps and moderate inclines. Age is not important as long as you are reasonably fit and a good walker. If you have mobility issues this is not the right tour for you. Please call us if you have questions. Transfers from Granada Airport to Hotel Casa 1800. All ground transportation Days 2-12. Morning transfers on Day 13 to Seville Airport and train station. 12 nights’ hotel accommodation with breakfast. 5 dinners and 4 lunches including beverages (wine or beer or soft drinks and water). If you are visiting Spain only for the 13 days of our tour you will want to purchase a multi-city flight into Granada and out from Seville. The Hotel Casa 1800 is located 30 minutes from the Granada Airport. Transfers will be scheduled after we receive the arrival times of all the tour participants. Your tour manager will be expecting you in the hotel lobby for a welcome meeting at 6:30pm prior to our welcome dinner. Morning transfers to the Seville Airport and train station. Most of the walking on this tour is not difficult but you will find some of it to be uphill, especially in Granada and the white villages. Be prepared to spend a few hours a day on your feet. Age is not important as long as you are reasonably fit and a good walker. Our tours are not suited for anyone who has problems with knees, back, heart or obesity. Are located in quiet locations within historic districts. European hotel rooms are generally smaller than those in the U.S., and have one queen bed or two twin beds, with private bath. We have space available for two or three singles on each of our tours. They are provided with single-use double rooms. Please contact us for availability prior to booking.